Because we live in the desert, our un-irrigated pastures cannot support cattle over the summer (unless they wanted to eat dust). Last Summer we were able to rent some irrigated pasture, but it fell through this year so we had to sell our herd of beef. But there's one cow-calf pair left. 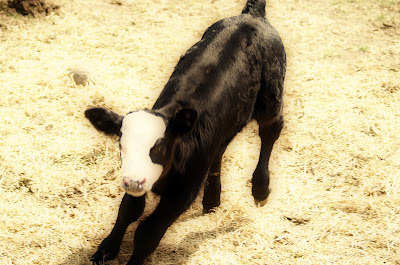 Out of all the calves born this year, he's undoubtedly my favorite. He's also the first calf I haven't named after a variety of beef jerky. I mean, he still doesn't have a name like Norman, or Wilbur, or George... but "Calfy" is better than "Teriyaki," right? He's not the only baby around the farm these days, though. And apparently even the mother has left them. Don't worry. We're calling a local bird sanctuary to come save them. I wonder if there's any such thing as owl jerky.